Learn the secrets Greek fishermen have known for centuries. For a sweet, tender, melt in your mouth taste, you must first treat or tenderise octopus before cooking it. If you eat a cooked octopus that hasn’t been tenderised it can be tough as boots. 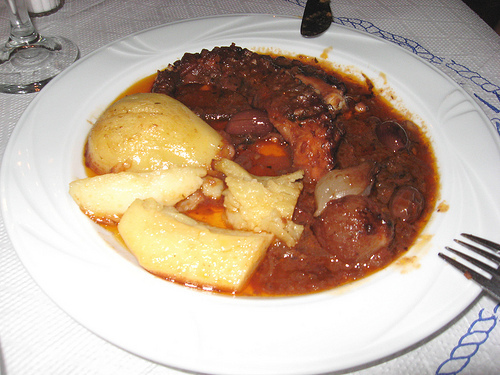 It is one of those delicacies that Greeks love, they fish it and cook it in many different ways. 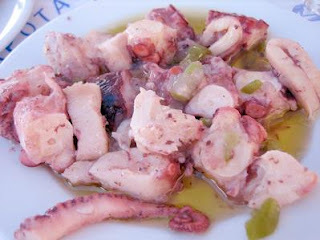 In order to obtain a soft, creamy, tender octapodi, you do need to tenderise octopus. 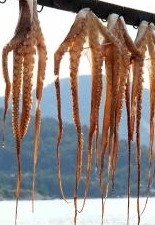 The Greeks, being a nation of fishermen, have always known that you must treat the oktapodi before cooking it and perfected the best method of how to attain this. It is also the best way to learn how to clean an octapodi, as it gets rid of the slime! Once you tenderise it, you can use it in any of your favorite seafood recipes. 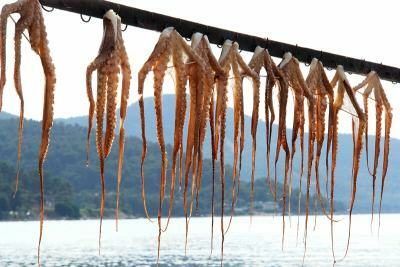 This is the Greek method to tenderise octopus! By beating the octopus you tenderise the muscle and then by swirling it you remove all the slimy stuff from it. Traditionally it was beaten on a rock, there’s plenty of them around near the sea in Greece – but a rock or a hard place – it doesn’t make any difference! Stand beside either a rock or concrete slab, which is at your feet level. Bring the octopus up high over your head and throw it down hard with all your strength onto a piece of concrete slab or a rock. Do this beating action 3, 4 or 5 times. Then, holding onto the head, you need to rub it or swirl it around on the rock or concrete. Rub it for a minute or so, rubbing all parts of the octopus over the hard surface. Repeat these two actions again – beating, rubbing.After doing these actions twice, you then need to rinse the octopus, to remove the slime that comes out of it from this action. Rinse under a tap, or as Greek fishermen do – in the sea! Repeat these steps – beat, swirl, beat, swirl, rinse – several times. When you beat it throwing it down onto the concrete, even though it is dead, you will see it contract or tense up. After you have repeated the steps several times, the octopus is ready when you throw it down and it just flops on the rock – not contracting and also there is no more slime coming out it. Although these actions may seem a lot of work, you will have a beautiful, tender octapodi, in whichever method you use to cook it. I do not think you can use this method for baby octopus. This method is mostly used on large ones. It is now ready to be used in any recipe such as this grilled marinated octopus recipe. A little bit of oktapodi information for you. Octopus comes from the Greek word Octapodi. Octo in Greek is eight. Podi means leg. It has 8 legs! As with many Greek words, the word itself actually describes the subject!